Do you feel like you can’t overcome social anxiety because you’ve had it ever since you can remember, and you’ll have to live with it for the rest of your life? When we’re at the very bottom emotionally, we tend to feel like there’s no way out. Trust me, I’ve been there too. Luckily, the situation is not as gloomy as it might seem. Just because we don’t see the light at a certain moment, doesn’t mean that there’s no hope! In other words, if you don’t know the path that will lead you to the life you want, it doesn’t mean a path doesn’t exist. Let me show you! Here are a few points that will hopefully encourage you to take the path of overcoming social phobia. You deserve to live up to your true potential and discover the inner peace lying within you! 1. Social anxiety is a result of unhelpful core beliefs and thinking patterns. Every thought creates a neural pathway in your brain, and thoughts form into core beliefs, which then influence the way you think, feel and behave. Fear of social situations is a consequence of the thinking patterns and belief systems, which are shaped, in big part, by the environment and events that you endured in your early childhood. The good news is this: just as you’ve learned to cultivate unhelpful thoughts and beliefs creating neural pathways that don’t serve you, you can unlearn unhelpful beliefs and create brand new pathways that will work for you, not against you. 2. Social anxiety is not caused by genetics. Traumatic events usually mark us most when we are still small children, so it’s not surprising if you’ve had social anxiety ever since you can remember. However, that doesn’t mean you were born with it. Even if your parents used to struggle with social anxiety (or still do), that doesn’t mean they passed it to you through their genes. It’s rather through the example of their behaviour and their own anxiety that you’ve learned and adapted those same patterns and behaviours. You might have a predisposition to anxiety, or be an introvert who loves to be alone, but that doesn’t mean you will automatically struggle with social anxiety or that you can’t overcome it. 3. Social anxiety is not a personality trait. You might have personality traits like introversion, high sensitivity, and neuroticism that make it more likely for you to develop social anxiety over time, but it’s not the traits themselves that cause it. Social phobia is a consequence of a combination of certain personality traits, the environment, and the events that you experience. For example, if you are a Highly Sensitive Person (HSP), you process all experiences more deeply than people who are not a HSP. HSPs are more sensitive to any kind of traumatic events, especially in childhood when we haven’t learned how to step back from a situation and look at it in a different way. If a highly sensitive child experiences a lot of rejection and emotional or physical abuse, they will be more prone to social anxiety as an adult compared to a non-HSP. However, it’s not the high sensitivity itself that caused social anxiety, but the way that person processed traumatic experiences. In other words, based on past experiences, the person formed core beliefs that triggered social anxiety. The same applies to any other personality trait that might make someone more prone to social anxiety. Keep in mind that countless people, including me, used to struggle with social anxiety terribly, and managed to overcome it. You are not different from us regarding your capacity to transform yourself, find inner peace, develop self-confidence, and thrive as a person. A lot of us felt hopeless at some point and used to think we would never get rid of this numbing fear and feelings of inferiority. We decided not to give up and kept walking the path of personal transformation. Once you’ve been shown the way, all you need to do is follow it! Because as long as you blame facts you can’t change for causing your social anxiety, you’re taking the power to heal out of your hands and won’t commit to overcoming your fears, developing self-confidence, and having the meaningful social life you want. You have a glimpse into the way your brain works, and know that social anxiety is a consequence of certain thinking patterns and core beliefs you’ve developed while growing up. So now, it’s time to transform those unhelpful thoughts and beliefs into ones that will bring you inner peace and unshakeable self-confidence. 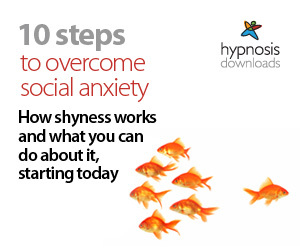 If you’d like to overcome social anxiety and transform your social life, check out the “Bye bye, Social Anxiety” guide and get on the fast track to inner peace and lasting confidence. It’s an extensive ebook I wrote, based on my own experience with overcoming crippling social phobia. Thank you for taking the time to read this article. If you have found it helpful, remember to spread the love and help others on their path to inner peace and social confidence by sharing the article on your favorite social media.